One of the principles behind GOV.UK is that users shouldn’t need to know what each government department or agency is responsible for in order to find the information or service they need. In the main, that still holds. However, there are a small number of agencies and arms-length bodies that the public closely associates with the services they provide. People will look for these agencies first, then their services. The first evidence for this was when the Driver and Vehicle Licensing Agency (DVLA) transitioned to GOV.UK. 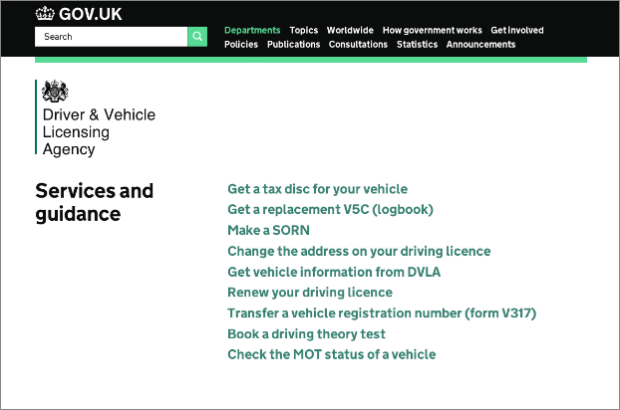 We soon noticed that a very high proportion of the searches starting from the new DVLA homepage were for that agency’s services, eg “driving licence” and “theory test”. Subsequent user research showed that people could see no obvious way - apart from search - to get from the DVLA homepage to its services. We did of course do user research before settling on this particular layout, and we’ll keep a close eye on how it gets used and iterate as necessary. What we expect is a reduction in the number of searches for DVLA services and a high number of click throughs instead. We’re also working on a way to allow visitors to organisation homepages to quickly view all the services and information provided by that organisation (in addition to the curated list of top tasks). We’ll be building that feature into both homepage designs. The alternative homepage layout is intended for organisations that have very little (if any) news, publishing or policy activity, but a high volume of users with very specific, service-oriented needs. The DVLA is a good example (which is why we’ve introduced it for their page first), but for DFT it wouldn’t be suitable. If you think your organisation would benefit from this type of homepage layout, please raise a Zendesk ticket.